Anyone who knows me well is aware that my favorite dishes to prepare – and eat – are soups and salads. I’m not talking about frilly, zero calorie salads consisting of a few pieces of lettuce and fat-free dressing. I prefer hefty, flavor-packed salads made of grains, beans, lettuces, fruits, vegetables…in every different combination and flavor profile. My girlfriend sent me a recipe she loves for a black rice salad, and I immediately asked if this was something she made. Turns out her friend brought it to a bridge luncheon. I made it, changed it (of course) and asked her to find out the source of the original recipe. As it turns out, this was published in the June 2012 issue of Bon Appetit. What I am sharing here is my version with some changes I made the first try and changes I like. My revised recipe has fewer steps, and more of a citrus punch. It is light, filling, and has the flavors I crave during the summer – zesty lime, salty fish sauce, and herbaceous cilantro. I served this last night with some oven-seared Copper River King salmon and sautéed brocollini. The plate was visually stunning and texturally delicious. 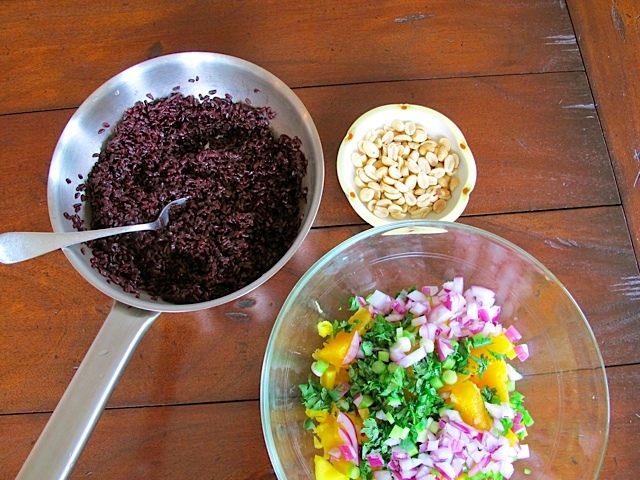 The black rice turns aubergine in color and with the orange mango and orange segments, cilantro flecks and peanuts, it is a gorgeous salad. Try it, you’ll like it. If you prefer more spice, add more jalapeno peppers. You can also adjust the amount of lime juice and fish sauce (or even leave out the fish sauce) to taste. And if you are one of those folks who hates cilantro try chopped parsley or even a little chopped mint. I dress the rice, then wait to combine it with the rest of the ingredients so that the mango and orange maintain their texture and color. Leftovers are good but not as pretty as the first time around. By the way, I bought my black rice at my Asian market, Uwajamaya. They carry every variety of rice known to humankind, and the package says “Dried Black Rice.” You don’t want to make sticky black rice for this one! I checked out black rice to see if it was good protein wise and nutrition wise. I plan to use black rice a lot more often now! See for yourself here: http://www.blackrice.com/nutrition/. 1 navel orange, peeled and sectioned. (Squeeze juice from membranes and reserve for the dressing). Cut orange segments in half. In a large glass bowl, combine the first six ingredients and set aside. In a 3 quart saucepan, bring water and salt to a boil, add rice — cover and simmer for 25 minutes until cooked. Drain very well and return the cooked rice to the saucepan off the heat, cover the top of the pan with a dish towel and let it sit 15 minutes. After this time, stir the rice (it should be dry) and put it in a clean large bowl. Let it cool to room temperature. Prepare dressing by whisking together the juice from the orange you peeled along with the lime juice, canola oil and fish sauce. Drizzle over the rice. When ready to serve, add this cooled, dressed rice to the vegetables and fruit in the large bowl. Add more lime juice or salt to taste, and sprinkle chopped peanuts on top. 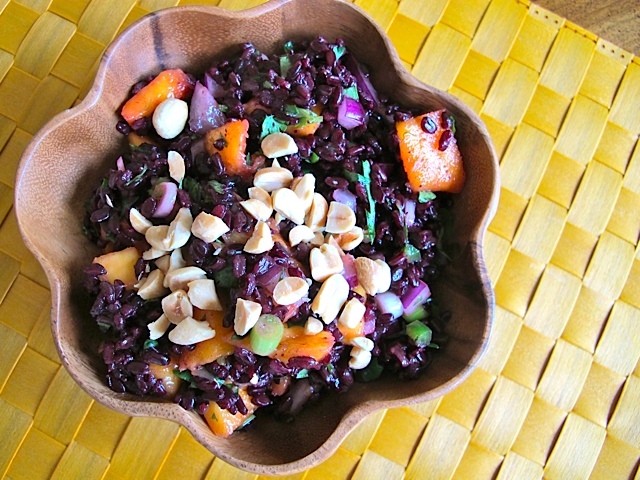 This entry was posted in Salads & Dressings and tagged black rice salad. Bookmark the permalink.